The EFG Bank team has been crowned victor at the opening act of Melges 24 European Sailing Series, mastering the complex conditions of the Piran bay. After mother nature forced the cancellation of racing on day one and light airs on Saturday, the Melges 24 European Sailing Series Act 1 came to a conclusion today in blue skies and a complete 180-degree wind shift blowing from the south and shooting bullets of breeze on the racecourse at unpredictable angles. The EFG Bank had three points advantage heading into the final day and held their nerve, despite the onslaught from FGF Sailing Team and Altea. “The racing was very tight at the top. 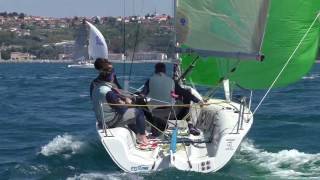 We had Altea and the Hungarian boys who were always right there and showing great speed and boat handling. I am sure they will show even better results as the season goes by,” commented the current world champion Chris Rast, who joined forces with the sailing icon Flavio Favini, Giovanni Ferrari, Aldo Bottagisio and Jaro Furlani. 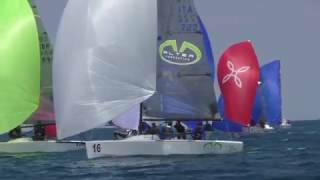 In the chasing pack the battle was on for the remaining podium positions between Altea and the FGF Sailing Team. On a day where starting successfully and reading the wind shifts paid dividends, the team from Italy barely put a foot wrong, clocking up a well deserved 3rd and 5th place. “Unfortunately we had problems with starts on the first day, but improved towards the end and finished second overall, which is a good start of the season,” commented Andrea Rachelli. A second and a tenth place in a nail-biting finale showed FGF Sailing Team is a real contender this season, sailing consistently to finish in third overall as Gill Race Team had to settle for fourth. In the Corinthian division Eelco Blok’s Team Kesbeke/Sika/Gill took their time to figure out the shifty conditions. However, as the wind increased the team started to show their winning form, finishing the day with two back to back race wins. “We are familiar with the local conditions as this is our second year here. Our goal was to win in the Corinthian division which we ultimately did,” Joost Brouwer summed up. Team Kesbeke/Sika/Gill made a clear statement – they are out for the win. After 6 races and one discard the curtains close in Portorož and the 2016 Melges 24 European Series now heads for Austria where the second round will be played out on Attersee over 10-12 June. The six Act Series will now move on to Attersee (Austria), 10-12 June.